Part 1: Hearing Aid Battery – Where Are We? Hearing aids are electronic devices that apply amplification provided by a power supply, most usually called the “battery.” The power supply provides the energy to drive the hearing aid (an electrical load). What the power supply (hearing aid battery) does is to essentially convert one form of electrical energy to another. Although historically, “battery” refers to a power supply composed of multiple cells, the usage has evolved to include power supplies composed of a single cell, as used in most hearing aids. These are single-use, or disposable batteries, used once, and then discarded. They are most often used in portable devices that have low current drain, such as hearing aids or in other situations where alternate electrical power is intermittently available. The electrode materials are essentially irreversibly changed during discharge, meaning that they cannot be readily recharged, or returned to their original forms. Prior to current zinc-air cells for hearing aids, older mercury disposable cells could typically lose 8 to 20% of their original charge when stored at room temperature (20-300 C) for the first month, and then 2% for subsequent months1. It was because of this that some companies recommended storage in a cooler environment (refrigerator, not freezer). However, with zinc-air cells used in hearing aids this is no longer an issue and storage in a refrigerator is no longer recommended. A secondary battery can be discharged and recharged multiple times, with recharging provided by an alternating current (AC) electrical power supply (wall socket). The electrode’s original composition can be restored by reverse current. Some hearing aids provide for the interchange of use by secondary and/or primary batteries. However, secondary batteries cannot be recharged indefinitely. This is because they lose electrolyte, dissipate the active materials, and show sign of internal corrosion. Secondary batteries have a more rapid self-discharge rate (loss of original charge) than do primary batteries. Figure 1. 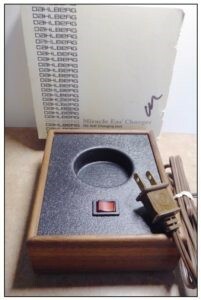 Miracle Ear Charger, Dahlberg Electronics, Inc., Hearing Systems Division. The hearing aid(s) turned off, but are left in the hearing aid with both placed in the round cavity. Batteries were to be charged daily for 8 hours minimum to ensure adequate charge. (Staab collection, product of the late 1960s or early 1970s). The hearing aid industry has made available rechargeable batteries for many years. In the 1960s and 1970s, especially internationally, rechargeable cells were used commonly. These were recharged by taking energy from a larger milliamp capacity and transferring it to the hearing aid button power supply via direct usurpation (DK10 and DK20 cells). Others have used solar power to restore battery function. However, the life cycle performance and recharging time of earlier products were not good. The past few years have fostered a renewed interest in rechargeable batteries, partially as a result of the use of wireless hearing aid products/features that require higher current drain2. These have contributed to shorter battery life. This author has written previously about the potential future use of body energy to power hearing aids. Currently, a number of rechargeable hearing aids are available. These consist mostly of hearing aids that are placed in a charger, with the cell charging while remaining in the hearing aid. These are a takeoff on rechargeable hearing aids sold by Miracle Ear (Figure 1) and a few others, mostly in the early 1970’s, but with improved cells and ability to hold the milliamp capacity. Additionally, a survey conducted by Kochkin in 2008 showed that 45% of consumers rated battery life of their hearing aids to be less than satisfactory. They believed that rechargeable hearing aids (actually rechargeable batteries) would increase the likelihood of new purchases3. This request was expressed again in 20144. This refers to the amount of electric charge the battery can deliver at the rated voltage. In hearing aids, the size of the battery generally determines what the battery capacity is. The more electrode material contained in the cell, the greater its capacity. Consider an analogy of the battery as a water storage tank. The larger the tank, the more water it can store. In a hearing aid battery, the larger the battery, the greater the mAh (milli Amp. hour is the measurement unit) capacity (storage) of cells used in hearing aids, even though large and small hearing aid cells develop the same open-circuit voltage. In the case of hearing aids, the open-circuit voltage (V) is 1.4 Volts (Table 1). It is important to understand that the mAh capacity varies among manufacturers. The values shown in Table I are an approximate estimate from among the suppliers and shows the common hearing aid battery sizes. The size identifications are those designated by the ASA (American Standards Institute) and IEC (International Electrotechnical Commission). Some companies often use a different letter(s) in front of the numbers, but all use the color combination for proper identification. In making the calculation, the multiplier of 0.7 is not often used to calculate hearing aid battery life because the zinc-air cells used are believed to hold their storage capacity for a long period of time without significant deterioration. In that case, battery life calculations will be longer. However, it may apply to rechargeable hearing aid batteries. A more detailed discussion of issues that affect battery life is found in previous posts (February 9, 16, 23, and March 1, 2016). The percentage or fraction of the stored charge a battery can deliver depends on many factors, among the most important are: battery chemistry, the current drain (rate at which the charge is delivered), the required voltage required of the hearing aid, how long it has been stored, and the ambient temperature. At low temperatures, a battery cannot deliver as much power because its capacity drops. Figure 2. 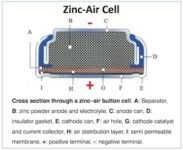 Zinc-air hearing aid battery diagram. An electrolyte substance within the battery (B) allows chemical reactions (ion movement) to be completed between the anode (negative side – C ) and cathode (positive side – E), allowing current to flow from the battery and perform work (Figure 2). In the case of hearing aids, the work is amplification. The very first hearing aids were powered by Leclanche batteries. Originally a wet cell (cell having a liquid electrolyte), it was adapted to operate as a dry cell (cell using a past electrolyte, with only enough moisture to allow current flow). This allowed for operation in any orientation without spilling, and making it suitable for portable equipment, such as hearing aids. Many types of electrochemical cells have been produced using various chemical processes and designs. These include galvanic cells, electrolytic cells, fuel cells, and voltaic piles5. The most common for hearing aids have been electrolytic cells, but some hearing aid companies are preparing for fuel cells (more on this later). Table II shows the most common hearing aid cell type chemistries that have been used in the “modern” era, along with additional descriptive information. Current hearing aid use mostly the zinc-air cell. The primary reason for this relates to the 1996 Mercury-Containing and Rechargeable Battery Management Act that was enacted to facilitate the recycling of nickel-cadmium (Ni-Cd) and certain small sealed lead-acid (SSLA) rechargeable batteries, and to phase out the use of mercury in batteries. Unfortunately, the EPA (Environmental Protection Agency) action failed to take into account that hearing aid cells did not have available an alternate mercury-free cell design. Having this brought to their attention, the EPA provided an exemption from this ban for button cells used in watches and hearing aids until such time that a robust mercury free design was available. Progress did not occur rapidly in that it took a total of almost thirty-five years following the introduction of the first zinc-air cells to make this transition! Self-discharge of batteries – Corrosion Doctors Retrieved 27 December 2016. Freeman, B. A new door to rechargeable hearing aid battery solutions. Hearing Review, July 29, 2015. Kochkin S. MarkeTrak VIII: The key influencing factors in hearing aid purchase intent. Hearing Review. 2012;19(03):12-25. Better Hearing Institute (BHI). MarkeTrak 9. Washington, DC: BHI;2015. Spotlight on Photovoltaics & Fuel Cells: A Web-based Study & Comparison (PDF). pp. 1–2. . Retrieved 24 December 2016. Part II: Hearing Aid Fuel Cells? In the above section, it was mentioned that depending on its design, a power supply (battery) may obtain its energy from different types of energy sources, including electrical energy transmission systems, energy storage devices such as batteries, and fuel cells. Hearing aids have used storage batteries for many years, but what about hearing aid fuel cells? Obviously, having a hearing aid connected with an electrical cord to a wall outlet is/has not been practical because the hearing aid is a portable device. Therefore, hearing aids have traditionally used batteries (energy storage devices) as their source of power. Substantial improvements have occurred over time, with one of the most significant being able to provide more storage in a single cell, rather than in a battery (an accumulation of cells connected to each other). Most hearing aids currently use zinc-air cells as their power supply. However, as hearing aids have become more sophisticated, including Bluetooth options and utilizing streaming, circuit current drains have gone up substantially, and the power supply has become one of the greatest obstacles hindering expanded use of new wireless transmission. It is with interest, in addition to more traditional methods to the management of the power supply, that at least two hearing aid companies (Widex, along with the Danish Technical Institute)1,2, and Oticon3 are investigating the use of fuel cells as a hearing aid power source. The cell to be used by both companies proposes methanol as the fuel, and in the case of Oticon, possibly a higher alcohol. The Widex goal would be to have it as the same size as a zinc-air cell for exact replacement. The expected launch was to be 2012. Oticon’s patent was to use fuel cells in series to provide additional power to drive newer technologies. “Fuel cell technology, on the other hand, has a large unexplored potential that we expect to harvest in the future. Based on this technology, we are working on a solution to enable recharging within seconds. Fuel cells have many advantages. They are a clean and green energy source. Fuel cell hearing aids will be far easier to handle for the end-user, as battery change or lengthy recharge process is no longer needed.” (Lars Oddershede Sunesen, Oct. 20164). In essence, the cell would be “refueled” rather than “Recharged.” The applied fuel cell is called Direct Methanol Fuel Cell (DMFC). Such fuel cells, using methanol, have energy density about 3 times greater than that of a zinc-air cell5. Where the fuel cell fits generally into the battery map is shown in Figure 1. Now that we have an idea as to where it fits, let’s discuss what a fuel cell is, and how it differs from current hearing aid batteries. The fuel cell is also referred to as a “flow” battery. Understand that fuel cells have been used for many years, mostly for large scale power and heat. Figure 1. 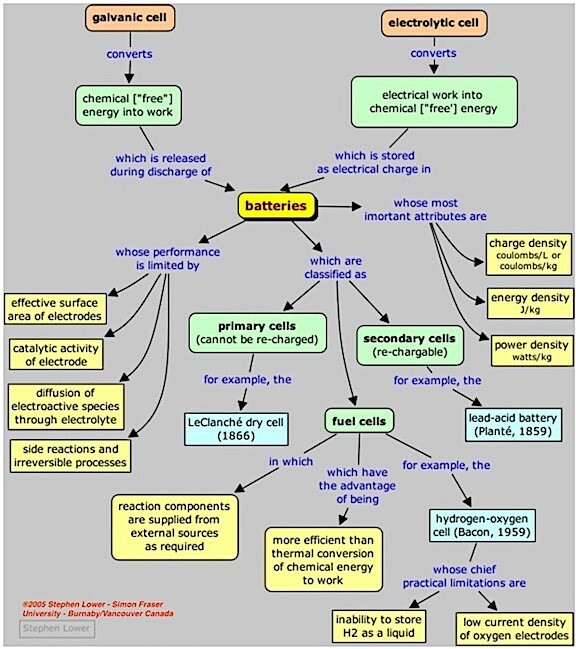 A general “map” showing the categories of batteries and how they relate to one another. (From: Stephen Lower – Simon Frazer University – Burnaby, Vancouver, Canada, ©2005). The following section describes fuel cells in general. The reader will consider using the term “methanol” to replace “hydrogen” in these explanations because this is the fuel being considered in hearing aids. A fuel cell is a device that converts chemical energy into electrical energy. It works like a battery, but is continually fed with a fuel – usually hydrogen. A fuel cell is a like a battery in that it generates electricity by an electrochemical reaction. Every fuel cell has two electrodes, one positive and one negative, called, respectively, the anode and cathode like batteries. Both convert chemical potential into electrical energy by reactions that produce electricity at the electrodes. Every fuel cell, like a battery, has an electrolyte, which carries electrically charged particles from one electrode to the other, and a catalyst, which speeds the reactions at the electrodes5. There are several different types of fuel cell technologies, often designed for specific applications. Regardless, they essentially all work on the same principles. Figure 2. General description of how a fuel cell works. (Modified from: ©2009 Clarkson University, Office of Educational Partnerships). In a typical fuel cell, gas (hydrogen) is fed continuously to the anode (negative electrode), and an oxidant (e.g. oxygen) is fed continuously to the cathode (positive electrode). At the anode site, the hydrogen molecules are oxidized catalytically and split into electrons and protons (Figure 2). An electrolyte (in this case a PEM) facilitates the transfer of hydrogen ions from the anode to the cathode. The electrolyte allows passage of protons, but not electrons. This allows for a positive and a negative charge, which generates an electrical current. The electrons cannot pass through the PEM, so instead, they pass through the electrical circuit and through the electric load (in the diagram, the light, or in our interest, the hearing aid), before reaching the cathode. Oxygen enters the fuel cell at the cathode and combines with the hydrogen ions and the electrons in a reaction that produces water (the product) as the exhaust. By using oxygen taken from the air at the cathode, this allows mostly fuel to be stored in the cell, this achieving a high energy density. Because of the way electricity behaves, the electrical current used to drive a device is returned to the fuel cell, completing an electrical circuit. The chemical reactions that produce this current are the key to how a fuel cell works. This feature, the use of oxygen from the air, is similar to current hearing aid zinc-air cells where oxygen is taken from the air and not stored in the cell. This feature allows for the cell to be filled primarily with zinc. 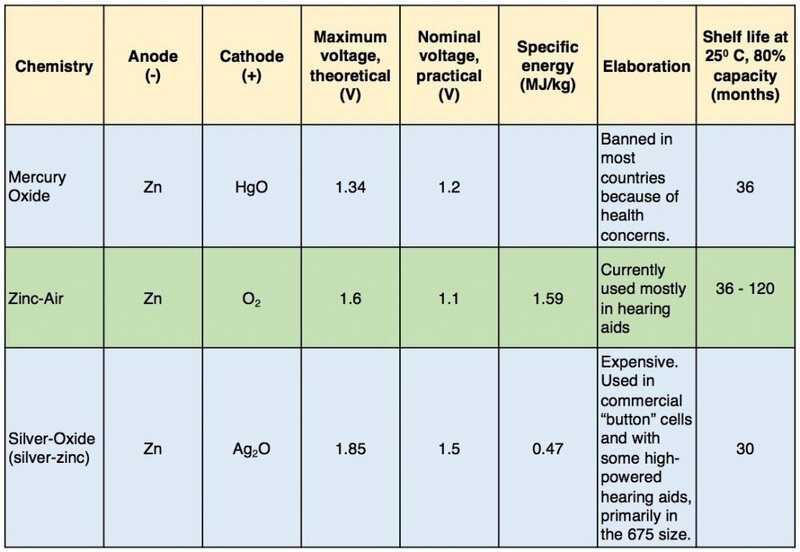 In effect, a zinc-air hearing aid battery has some properties similar to a fuel cell, which is the continuous use of oxygen, an outside and continuous free source, to help provide the electrical energy. Why Methanol as the Fuel? DMFC (Direct-Methanol Fuel Cells) are of interest for powering small portable devices rather than PET (polymer electrode membrane) because methanol provides a higher energy density than hydrogen (unless compressed), and eliminates the need for a fuel reformer6. Very small amounts of methanol are needed, which is good because methanol is a liquid reserve (perhaps 200 µl methanol and the hearing aid will have enough energy for 72 hours of use1). Significantly reduced recharging time – minutes rather than hours. Fuel cells are scalable, meaning that individual fuel cells can be compiled on one another to form stacks, which in turn, can be combined into larger systems7. This seems to be one feature of the Oticon patent3. The keys to moving fuel cells forward for hearing aid use is to make them practical and affordable. New Danish Research Project Will Develop a Micro-Fuel-Cell for Hearing aids, Fuelcellworks, December, 2009. Fuel cell, a portable electronic device and a method of manufacturing a fuel cell reservoir, Patent: WO 2013007256 A1. Filed July 13, 2011. Communication device for mounting on or in the ear, Patent WO 2002067628 A1, filed February 11, 2002. Leendert van der Ent. (2016). Market trends: the charge of recharge. Audiology Worldnews, October 20, 2016. Fuel cells make hearing aids easier to use. Danish Technical Institute. Fuel Cell Today. Smithsonian Institute. Fuel cell basics. Office of Energy Efficiency & Renewable Energy, August, 2013.